Highlands United Methodist has been a stalwart of the Five Points South neighborhood in Birmingham, Alabama since 1903. Highlands seeks to welcome all people tell them the Good New of Jesus Christ. Four Five Points, South neighborhood women, Eugenia Gillespy, Rosa Eubank, Loula Campbell and Sarah Louise Wilson, invited the Rev. John D. Simpson, presiding elder of the Birmingham District of the Methodist Episcopal, Church, South to tea at the Wilson home in early February of 1903 to discuss the need for a Methodist Sunday School in the neighborhood. Phillip Alosi, owner of the Palace Market, 1045 South 20th Street, the site of Highlands United Methodist Church. The market was rented for the Sunday School that became Highlands UMC. A room was secured in Phillip Alosi’s Palace Market, located at the site of the present church and Robert Munger was elected Superintendent. The first Sunday School was held on the first day of March with fifty-three in attendance. Much interest was shown in the Sunday School, and it was soon decided that a prayer meeting should be organized for Wednesday evenings. The Rev. Dr. James McCoy, editor of THE CHRISTIAN ADVOCATE, was invited to hold the services. Both the Sunday School and the Prayer Service were held in the Palace Market until September 12, when a new building called the Five Points Chapel was completed on the southwest corner of Eleventh Avenue South and Richard Arrington Boulevard and it was decided that a Methodist Church was needed at Five Points. On December 2, 1903, the Five Points Methodist Episcopal Church, South was officially organized with a charter membership of 183 people. The Rev. Dr. McCoy, who later became President of Birmingham-Southern College and later was elected Bishop, was appointed as the church’s first pastor. By 1904 subscriptions had been taken toward construction of a church proper. A contest was sponsored by the Board of Stewards for a building design offering a prize of seventy-five dollars for the first place design. According to Board minutes there were only seven submissions to the competition owing to the rigid requirements laid forth and the limited purse offered. The winning design was submitted by the firm of Wilson and Wendall of Columbia, South Carolina, and the second place prize went to P. Thornton Marye of Atlanta. In a strange twist of fate, the project was not offered to the contest winner but to Thornton Marye, who was in town working on the Terminal Train Station. Sunday School Superintendent and prominent businessman Robert Munger, who lived across Twentieth Street from where the new church was to be built, was greatly impressed with Marye’s work and persuaded the Highlands’ Board to accept the Marye design over the winning design. Marye designed several of Atlanta’s outstanding homes and landmarks including the Atlanta Terminal Station, the Southern Bell Building and, perhaps most notably, the Fox Theatre. Early photograph of Highlands c. 1910 taken from the front yard of Robert S. Munger's home across the street. Construction on the Sanctuary Building began in 1907, and with it came a new name for the congregation, Highlands Methodist Episcopal Church, South. After two years construction, the Spanish Renaissance Revival style Sanctuary was completed in March 1909. The long awaited structure was somewhat lacking because a shortage of funds prevented the completion of the bell tower. In 1921, a set of bells, cast by the McShane Bell Foundry of Baltimore, Maryland was anonymously donated in honor of Bishop James McCoy. Under the watchful eye of architect Bem Price, the thirteen bells weighing over 14,000 pounds were lifted into place by crane, and the tower was then constructed around them. The bells were dedicated on Christmas Eve of that year. The McCoy Tower Bells are still rung manually each Sunday before and after worship, for weddings, funerals and other special occasions. Since their 1995 refurbishing, they have also rung electronically every quarter hour with a Westminster Chime. Highlands grew rapidly and by the early twenties had outgrown the sanctuary building. 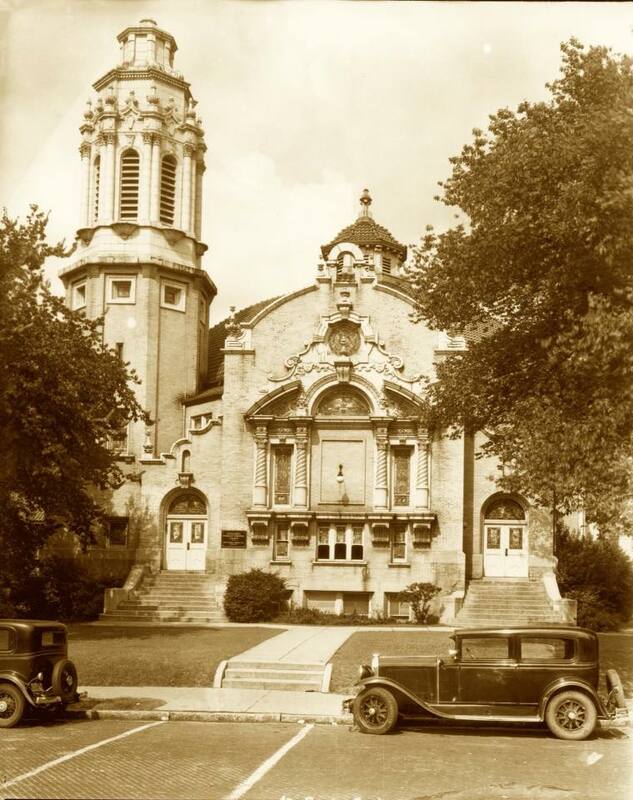 In 1924 work began on a new Church School Building designed by Bem Price in the Italian Renaissance Revival Style. The building was state of the art and included modern restrooms, high ceilings with detailed crown molding and light airy classrooms. The Church School building was cited by both the American Institute of Architects and the religious press for its excellent design. In 1950, the chancel of the sanctuary was literally turned around, making what had been the back of the church the front. The original design of the Sanctuary had a central pulpit located where the center doors under the balcony are currently located. The pastor’s office was in the present Narthex and the remaining chimney from a small pot bellied stove in that office can be seen above the right hand exterior doors of the church. Above the pulpit was a choir loft and below the stained glass windows at the top of the balcony was the organ. The1950 design extended the Sanctuary on the eastern wall almost fifty feet and incorporated a chancel with a divided choir and a central altar against the east wall with lectern and pulpit to each side. This was quite an innovation for a Methodist Church in the fifties. The late 1950’s and 1960’s brought much social turbulence to Birmingham as the community and the church struggled to come to grips with racial injustice. Highlands was not exempt from that struggle. Both leaders and members struggled over the implications of civil rights. The question of African Americans being welcomed to worship at the church arose, and opinions were divided. Under the leadership of some Highlands’ members, the Methodist Laymen’s Union which opposed integration, held an organizational meeting at Highlands. This action was publicly denounced by an attending Birmingham-Southern College student named Tommy Reeves, who was arrested after leaving the meeting for disturbing the peace. Highlands’ member and attorney David Vann represented the student, and the charges were dropped. As tensions mounted during this era, many fled the city over Red Mountain to the suburbs, and for the first time in the church history, the rolls of Highlands began to decline. The Five Points South neighborhood underwent a bit of a decline during the decade of the 1970’s becoming a bit tawdry but Highlands held her own. Thanks to the civic interests of many Highlands' members, the city dedicated resources to the revitalization of the neighborhood and new sidewalks and lighting paved the way for renewed economic development of the area. Nearly thirty years ago, Highlands’ members embarked upon a visioning process for the church and began to ask the important question: “What is God calling us to do at Highlands?” In answer to that question, the congregation started the Highlands Child Development Center, and established the Community Ministry and Project ID program for the Homeless, and undertook a capital building renovation which resulted in the new Greeting Space. Much has changed since our start in 1903 but much remains the same. We stand where the city and suburbs meet, and we are a church that seeks to welcome all people and tell the Good News of Jesus Christ. The ministry of our church still takes place in Sunday School classes as in did back then and worship still happens in our lovely sanctuary and we serve our neighbors daily in our Fellowship Hall. But we are more than a place, our members and our ministry reach out beyond this neighborhood to the entire metro region and beyond. Four women having tea in 1903 would unlikely dream that such magnificent structure would grow from their conversation and one day grace 20th Street, South or the tremendous impact that our church would have. Reflecting on our past and celebrating where we are today, one can only feel a sense of excitement about where God will lead Highlands in the future.